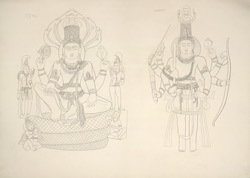 Pen-and-ink drawing of sculptures of Vaikuntha Vishnu and Ashtabhuja Vishnu from Cave III, Badami, by an Indian draftsman, dated 1853. The figure on the left in the drawing represents the sculpture of Vishnu seated on the coiled serpent Ananta, carved to the left of the porch of Cave III. He holds a wheel (chakra) in his upper left, a conch (shankha) in his upper right. The cosmic snake Ananta or Shesa is a symbol of the never-ending cyclic time. The figure on the right represents an eight-armed Vishnu. the town. Around the south fort there are four rock-cut shrines while structural temples dominate the site on the opposite north fort. Cave III was excavated during the reign of the Early Chalukya ruler Pulakeshin I in 578 and it is the finest of the caves of Badami. It has an elaborate sculptural ornamentation and consists of a long porch, a pillared hall (mandapa) and the small square sanctuary.